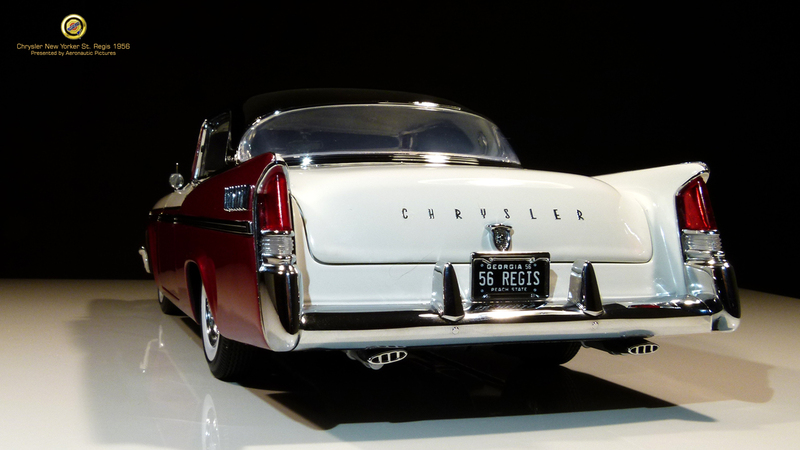 The 1956 “Chrysler New Yorker St. Regis” is a very cool name for a car! 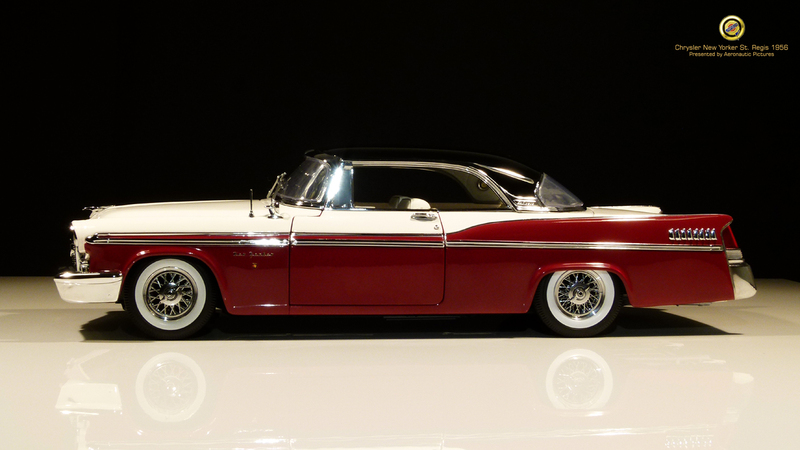 And now, we have the opportunity to purchase the car in scale 1:18, by the US. Brand ACME. 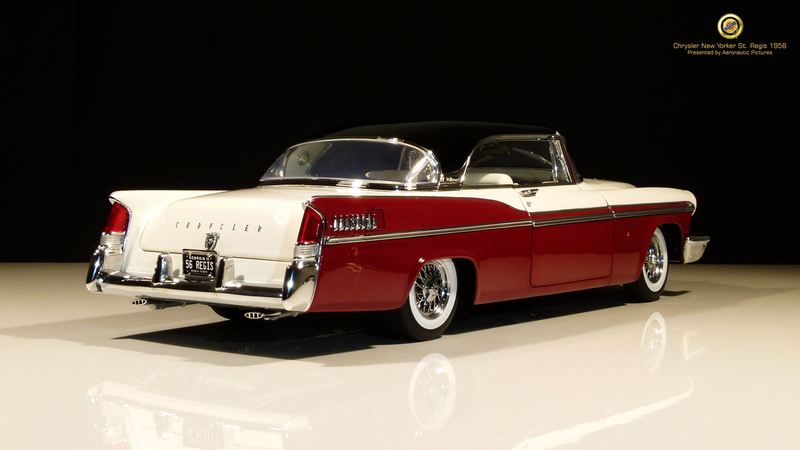 This very model is in limited production numbers, of only 552 models. If this will be a good investment only time will show. 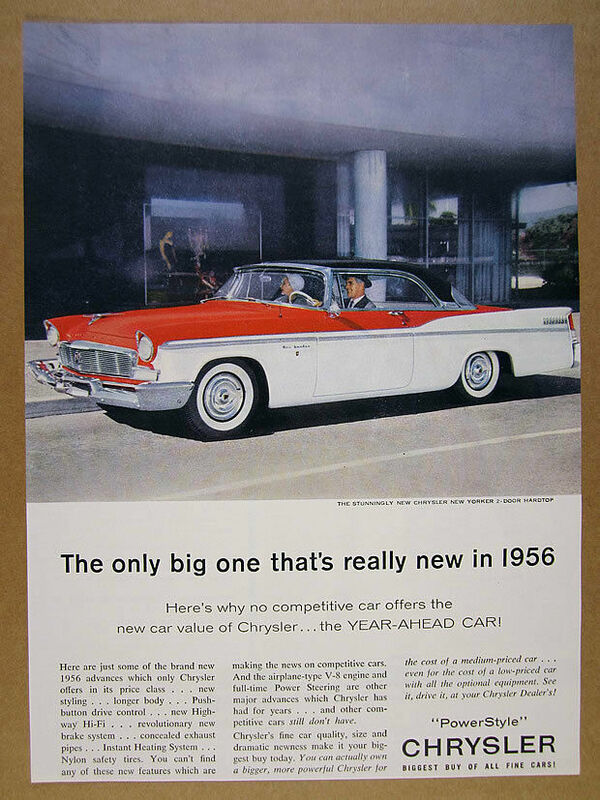 If we see how, out of stock models sells today via ebay.com like the Highway 61 brand, the investment looks good. 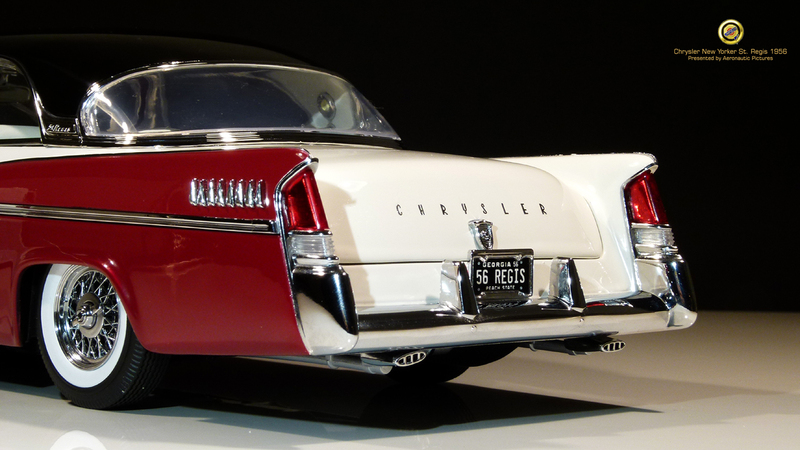 But a keen collector like me is only interested in the models level of realism and detail richness. 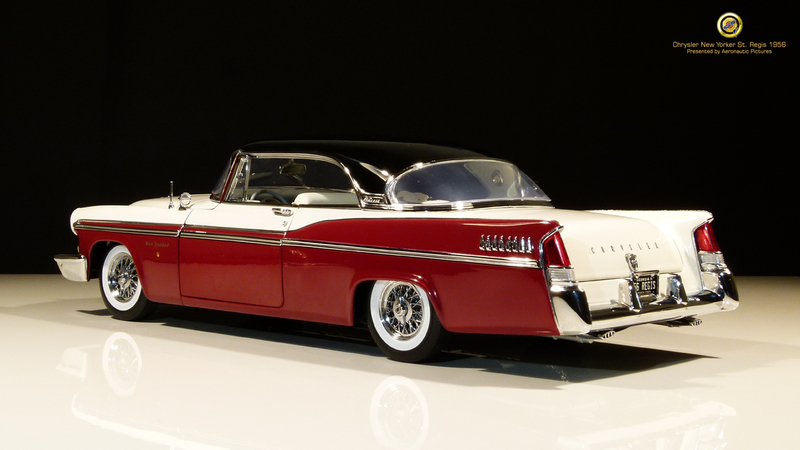 And when we talk of the maker of ACME models, our expectations is high, just remember the ACME 1957 Oldsmobile hardtop – A masterpiece. 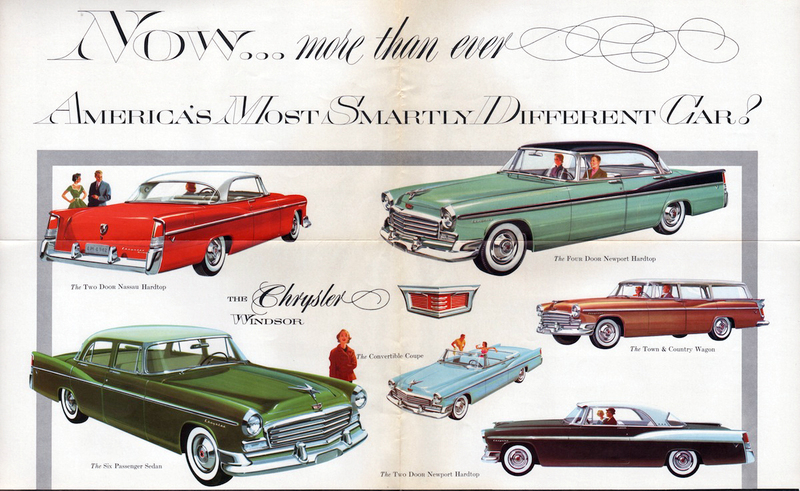 Back in the fifties, the fashion was two-tone paint and in this case tri-tone color combination. 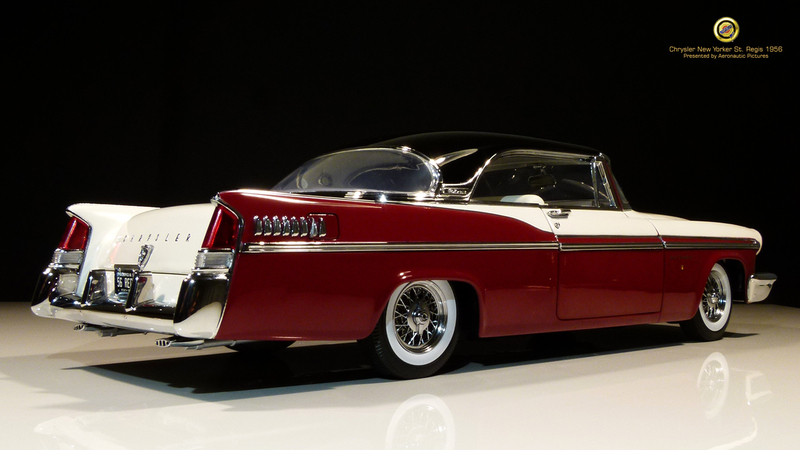 And I must say this 1956 Chrysler looks fantastic in Regimental Red, Raven Black and Winsor white. 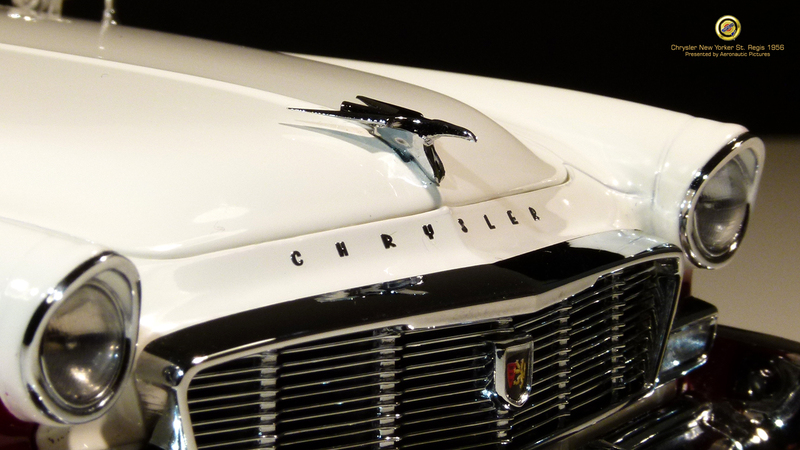 The paint work itself is second to none, except a small spot on the hood. The roof is like a piano lacquer with mirror effect. A detail that strike one at first glance is the wheels with the wire hubs and knock-off spinners; they are made in etched-metal and give the model at touch of glamour. 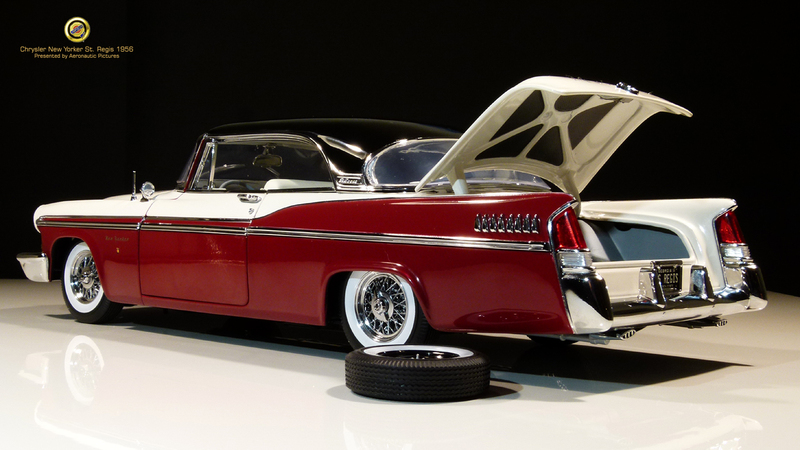 White wall tires and well moving parts shows ACME had thoughts on every detail here. 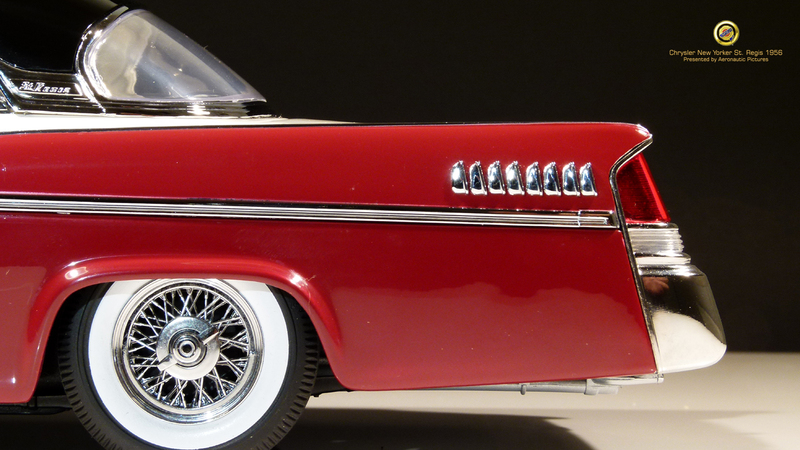 Chrome work all over the model is in high quality and shines like the real thing. 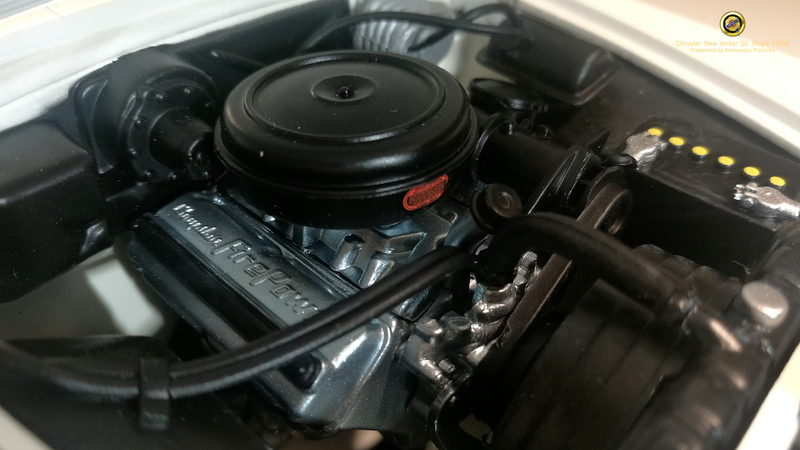 Some makers of model cars like Sun star have their photo-etched emblems “sealed” by a piece of plastic – not very realistic in close up photos and without, very fragile when polishing. But on this model the emblem is embedded in the gloss lacquer…Very good job here! Up front on the car the grill, bumper and headlights give the car its “face”. This face is not aggressive as on some cars. 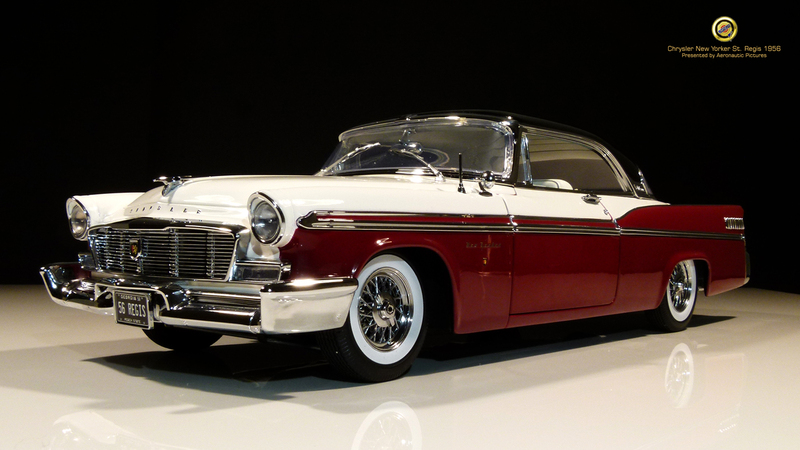 This one is more friendly and stylish, like a woman who knows, how many envy her for her good looks! 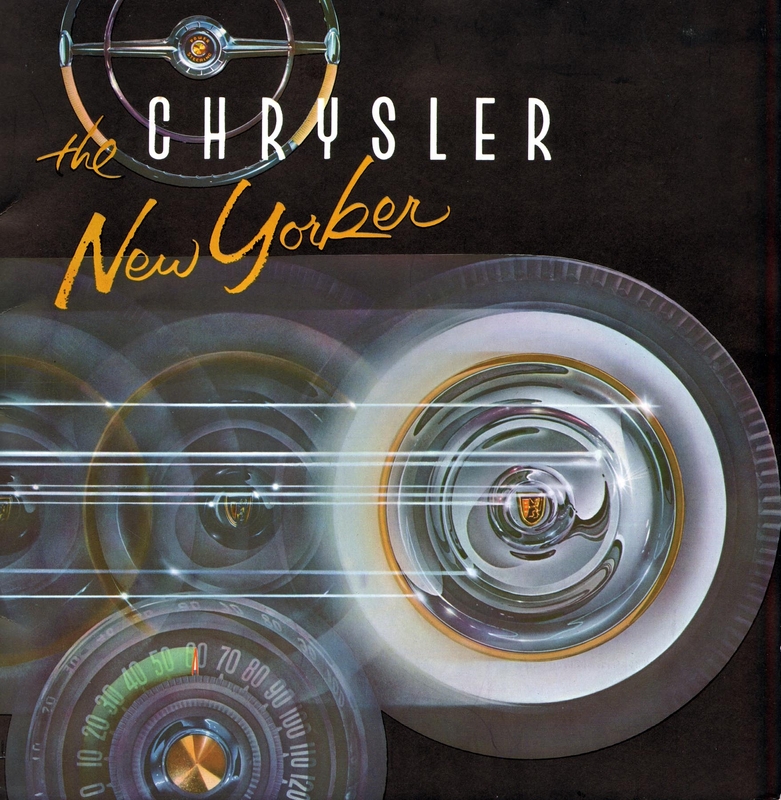 The model headlight lenses are perfect as you can glimpse the bulb in the center. 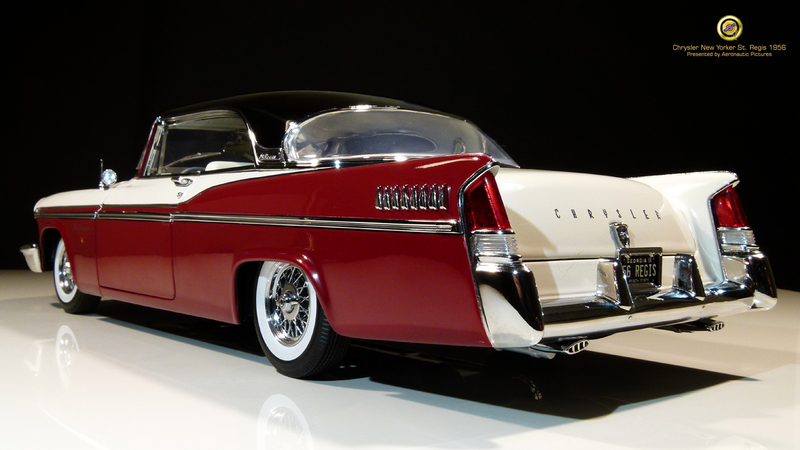 This Chrysler have a big ornament on the hood witch is well reproduced and sharp like a piece of art. 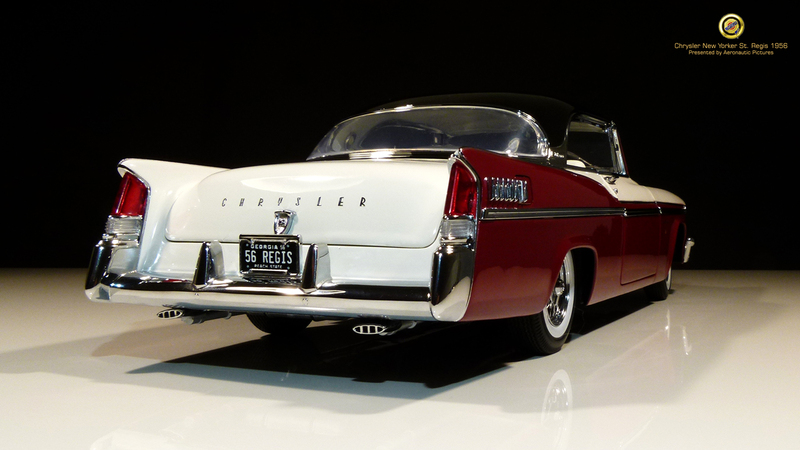 Speaking of art – At the rear of the car some of Chrysler most striking design feature reside “The taillights”. 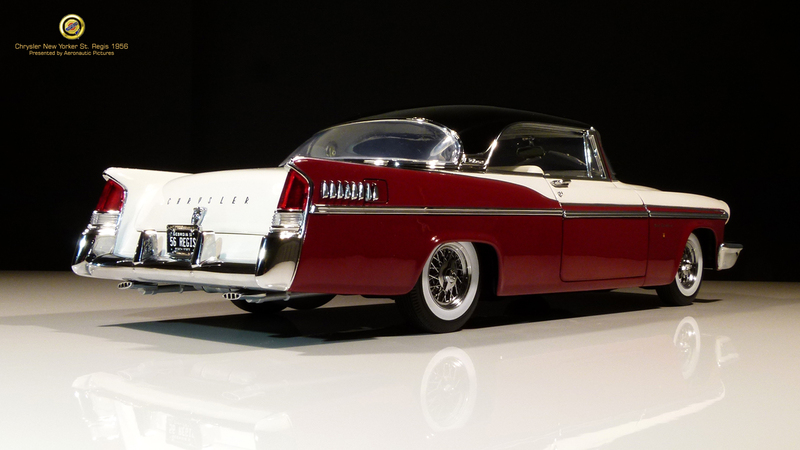 Thanks to Automobile designer Mr. Virgil Exner these enormous fin shaped, cathedral lights, is in my book one of the most fantastic sculpted ever. ACME had made precise replicas here too. 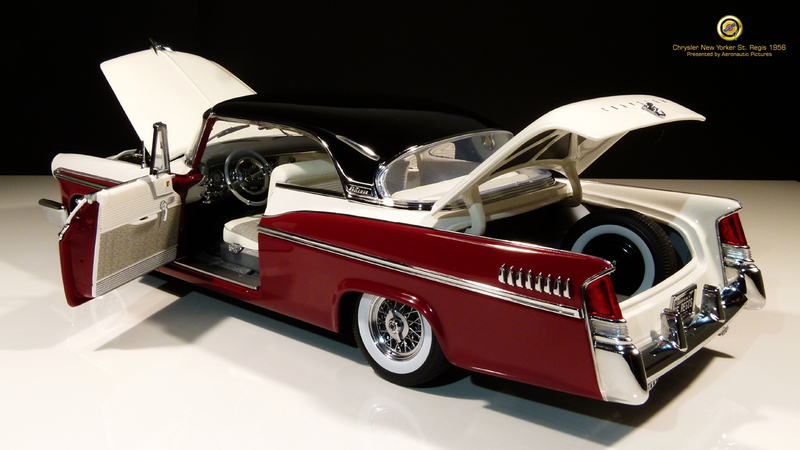 And this will go on, if you let your eyes wander all over the body of this wonderful model car. 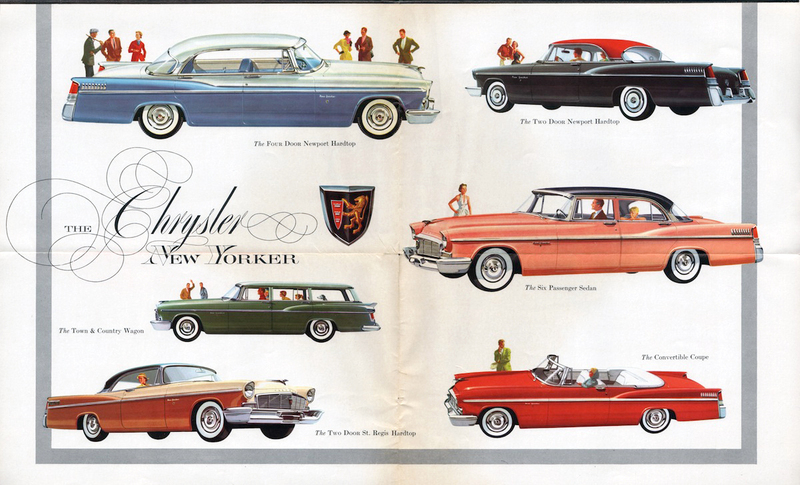 Shall we take a look inside Sir, – As the salesman gently opens the driver’s door? 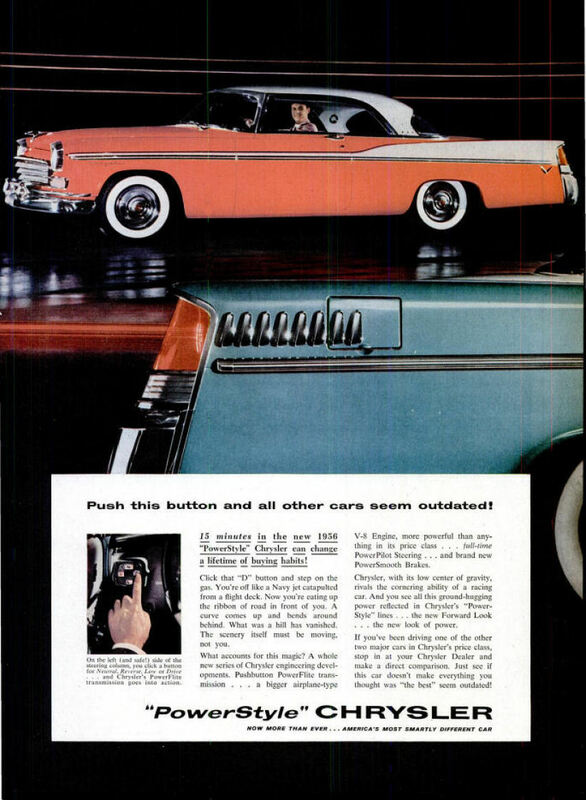 Please notice the two-tone steering wheel, push buttons for seats and gear selector, and readable gauges on the instrument panel. 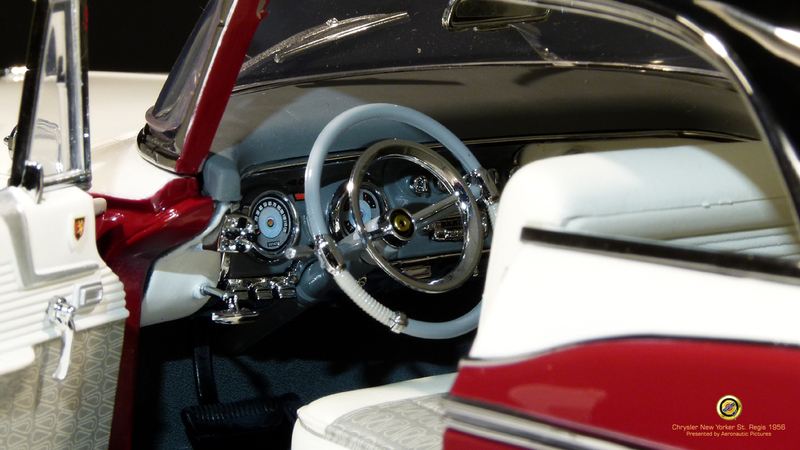 This is truly a well detailed interior – But no real carpet! The carpet is just molded plastic, will one say. Yes this is not what we will expect in this price range. But it look very realistic, both in pictures and seen in real. So it is hard to blame ACME anything here! 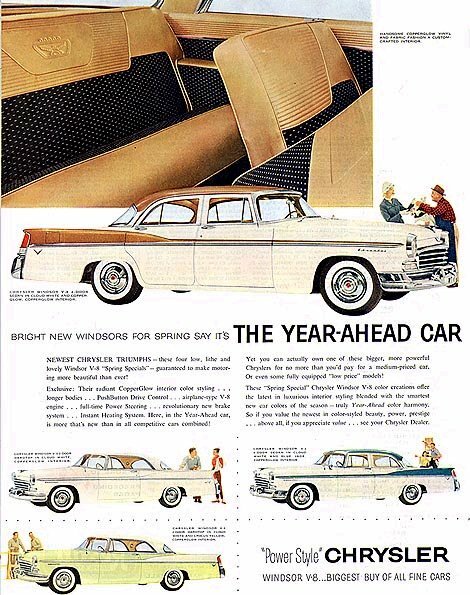 Before we close the well made spring loaded doors, look around at the headliner and lastly, enjoy the fabric on the seats and inner doors. 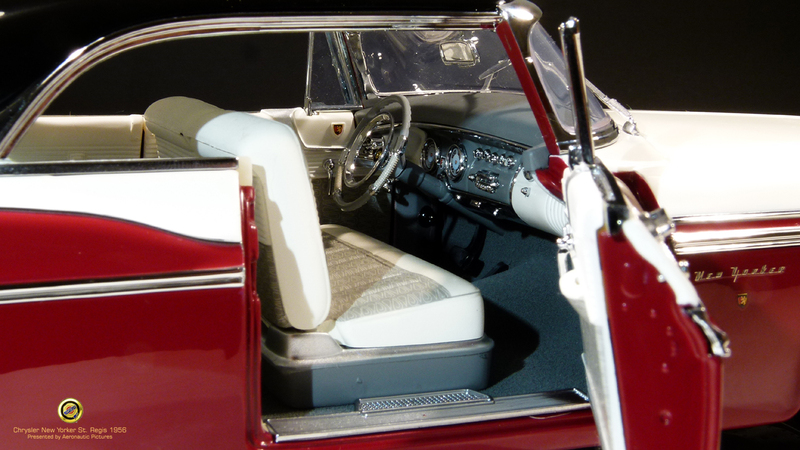 This is a cozy and stylish cabin that will suit every new proud model car owner. 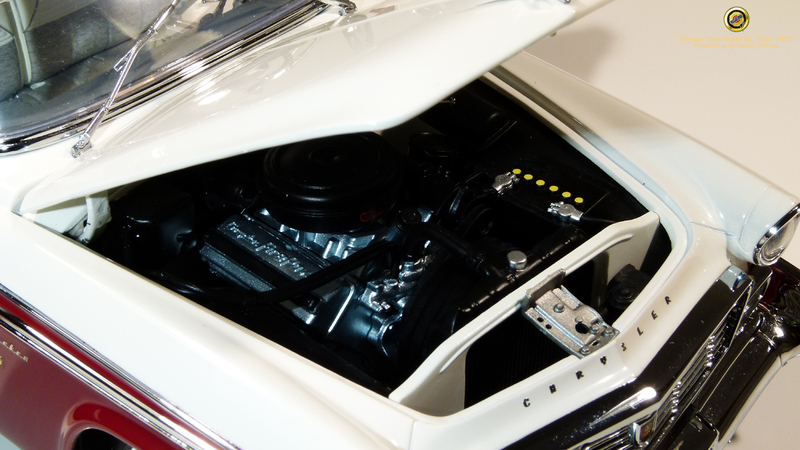 When it comes to judge model cars, one of the issues can be the gabs between the doors and body parts. 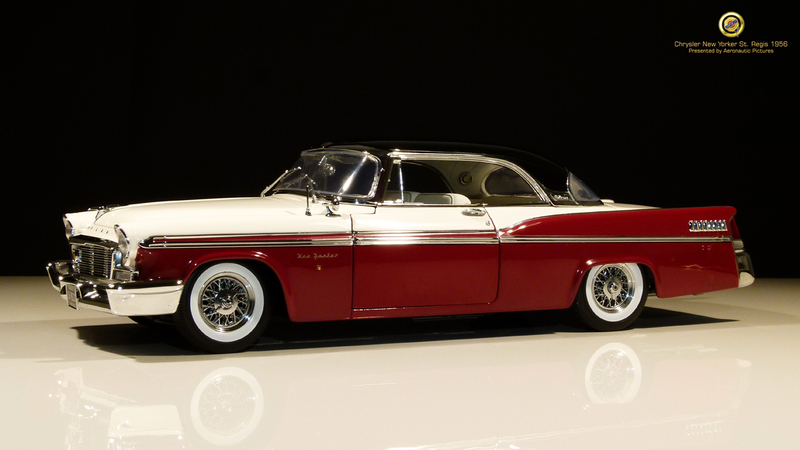 This can be a problem on some budget models, but here everything fits well; Hood, deck lid and doors fit nicely with the body and show attention to casting and assembling from the maker. 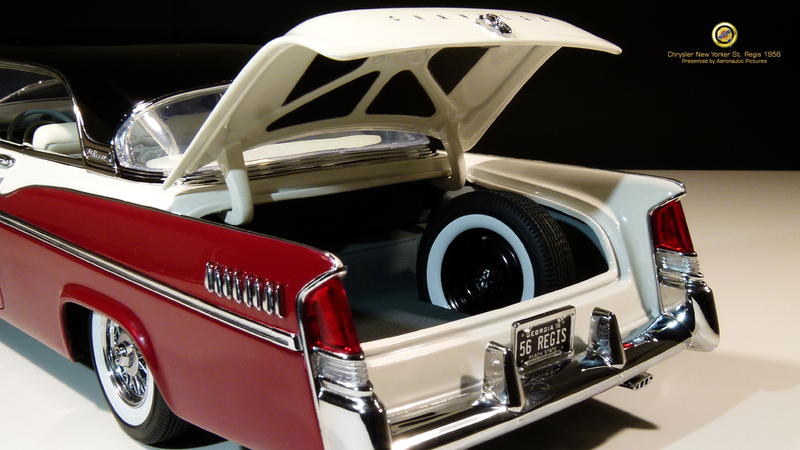 You can open the deck lid and take the spare wheel out for an inspection and please notice the black sound insulation on the inside of the deck lid – a feature only well detailed models have! 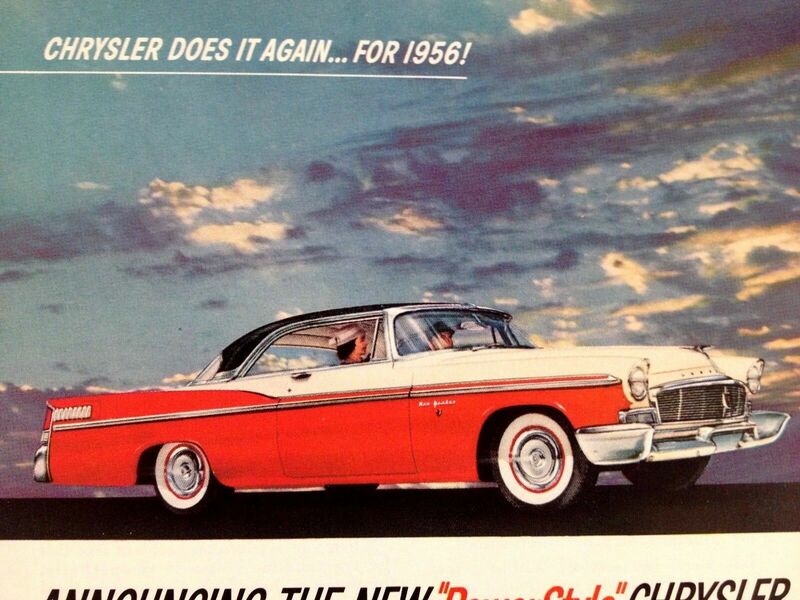 When some mention a Chrysler car, a few words later, you hear the word: Hemi. 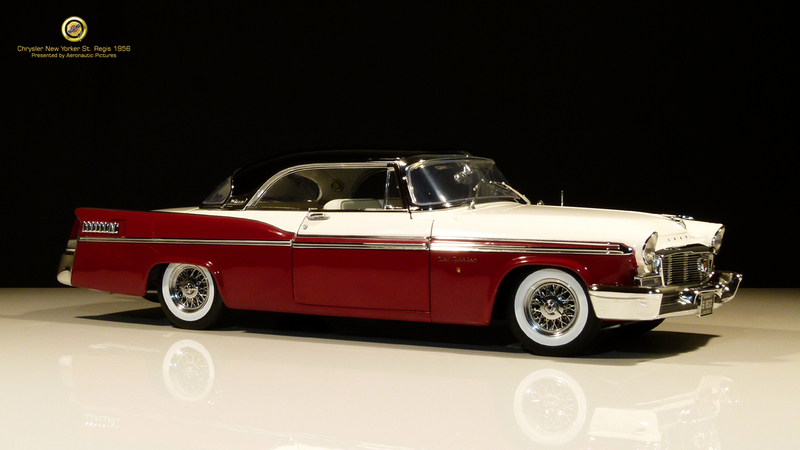 Yes, this model surely also have the Chrysler hemisphere V8 motor. Just pop up the hood and she lay here with all her glory. Here at last; do I like the model? ….. Oh Yes! 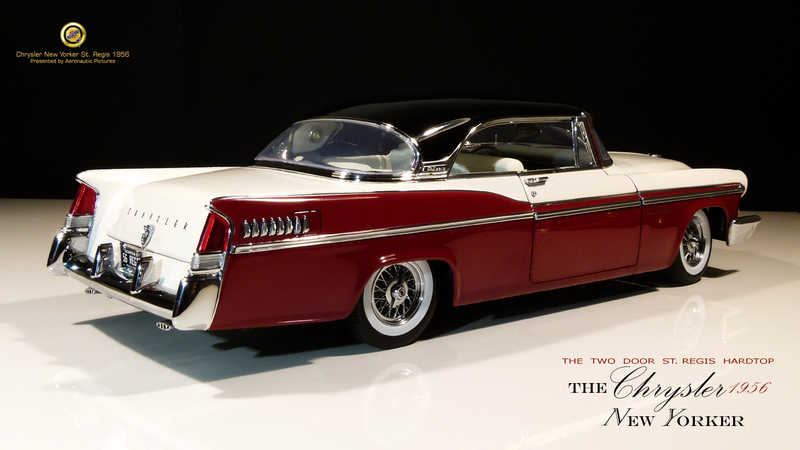 If you collect model cars from the fifties, don’t wait too long, as this truly masterpiece will not be available forever. I predict they will soon be out of stock. 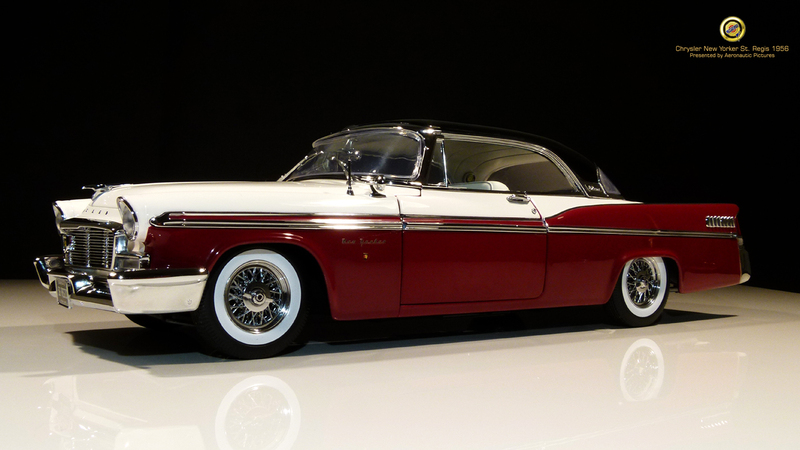 Beautiful car - and model! 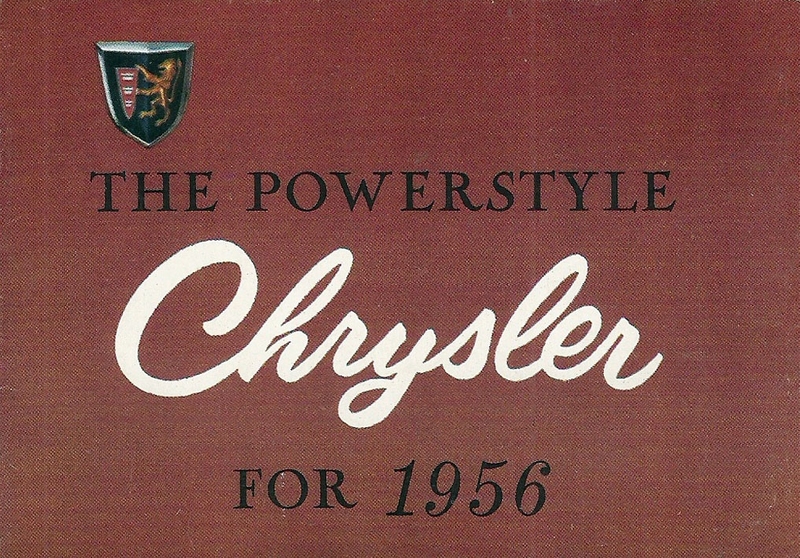 Chrysler christened the 1956 model year's design "PowerStyle," a product of prolific Chrysler designer Virgil Exner. 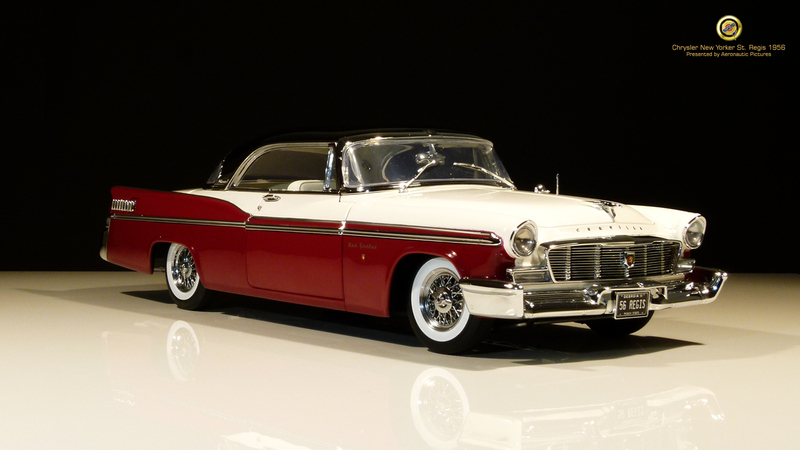 The New Yorker gained a new mesh grille, leather seats, pushbutton PowerFlite selector, and a 354 cubic inch Hemi V8 with 280 hp (209 kW). 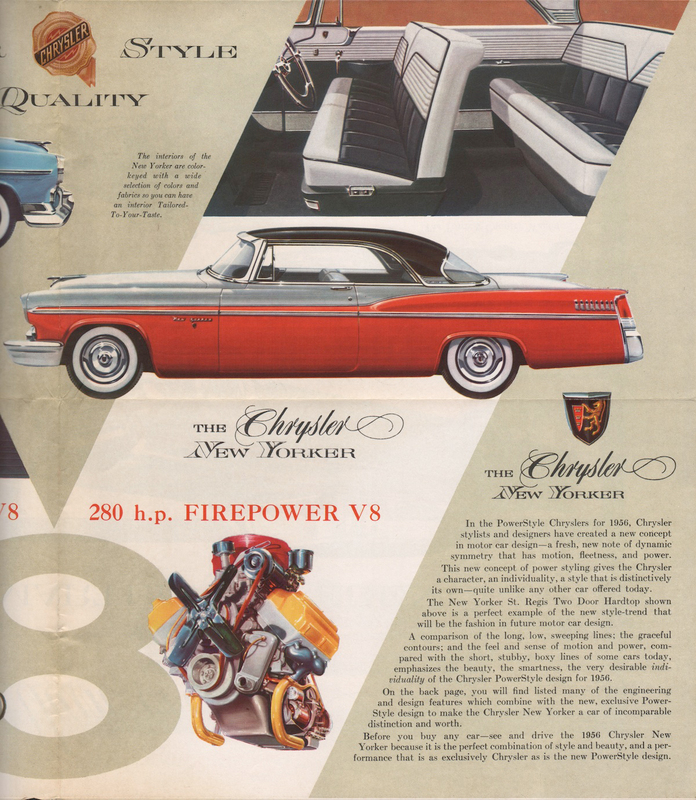 Also new for 1956, Chrysler introduced an under-dash mounted 16 2/3 rpm record player, dubbed the “Highway Hi-Fi”, manufactured by CBS Electronics. 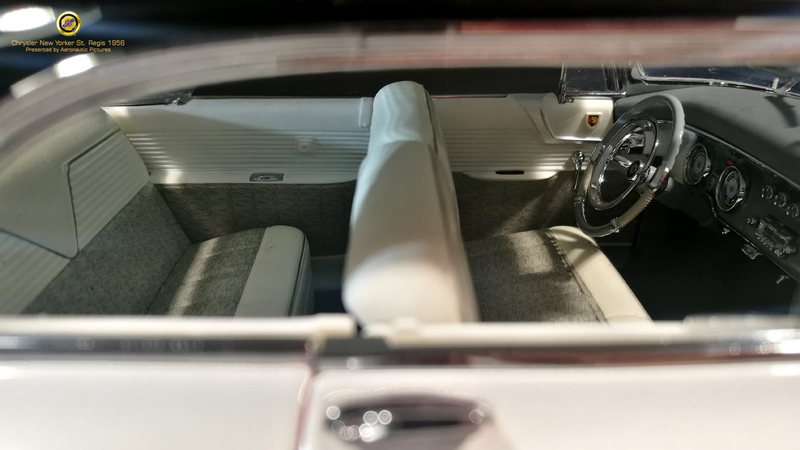 A two way switch in the dash changed the input for the speaker from the all transistor radio to the 7 inch record player. 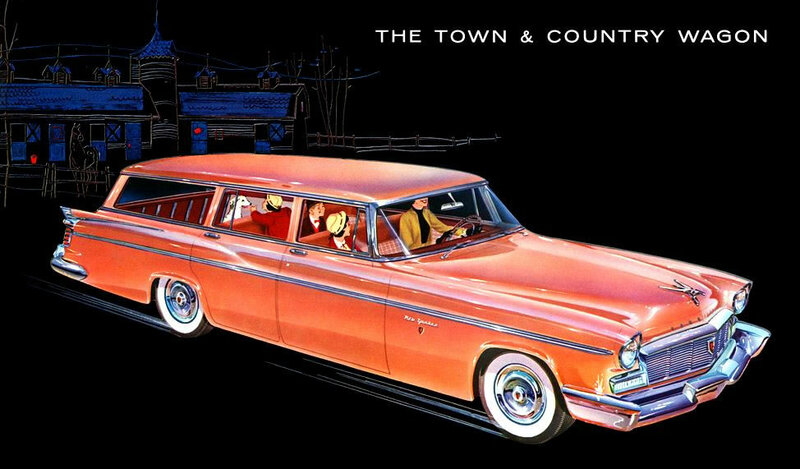 The St. Regis two-door hardtop gave a unique three-tone paint job for a higher price and the Town and Country Wagon model was Chrysler's most expensive vehicle of 1956 at $4,523. 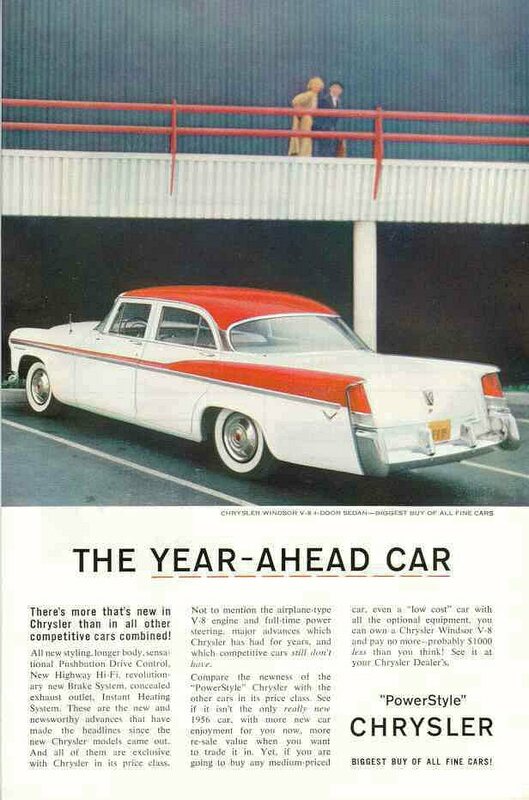 This was the first year for the New Yorker four-door pillar less hardtop. 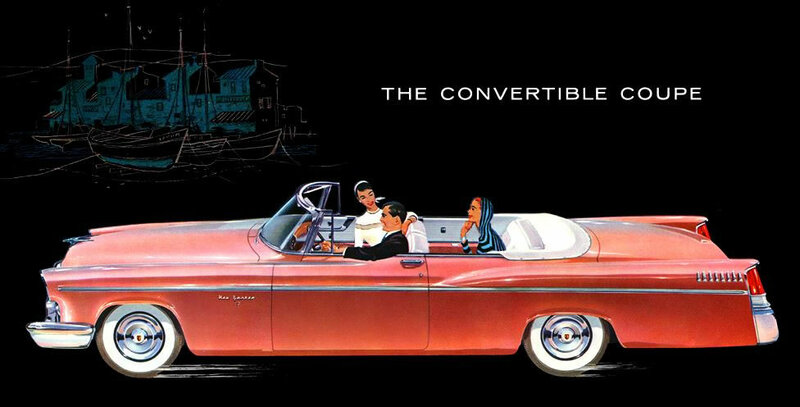 Only 921 convertibles were made. 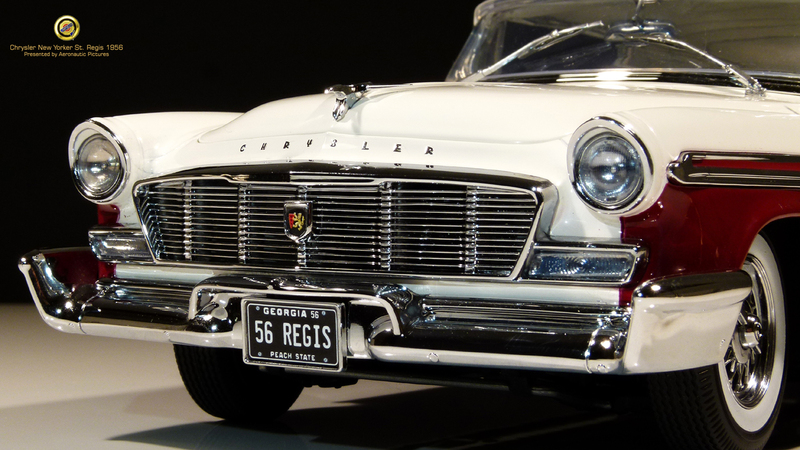 In the mid-1950s, the St. Regis name was most famously attached to a five-star hotel in midtown Manhattan, and the name was synonymous with the sybaritic luxury that only the truly wealthy could afford. 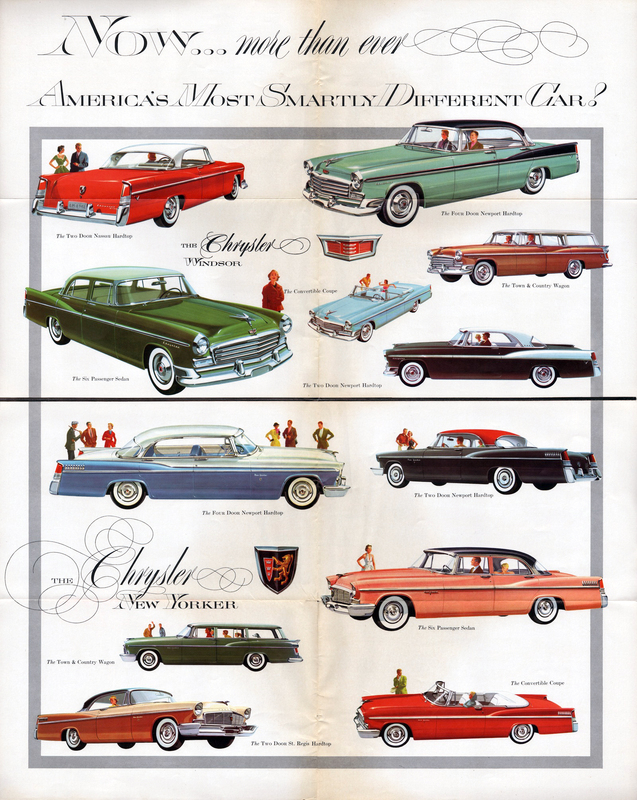 And thus, any vehicle so named must, by association, be similarly plush. 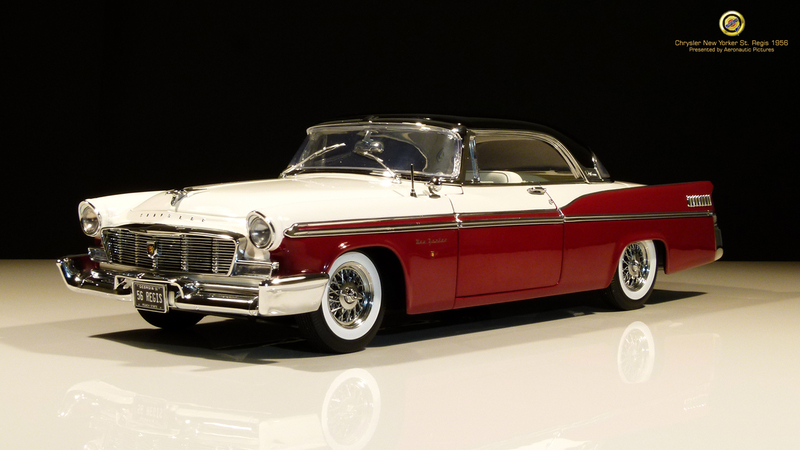 The Chrysler New Yorker St. Regis was new for 1955, but then, a lot was new at Chrysler Division that year; the corporation really mixed things up in the fall of 1954. 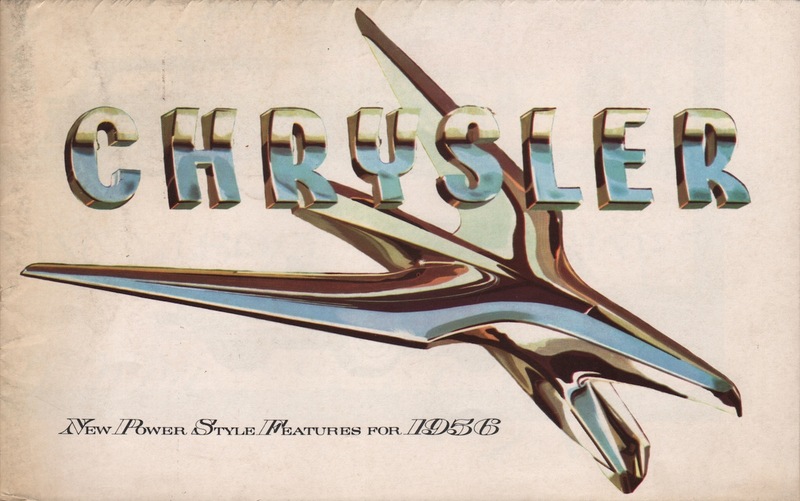 Forget the cars themselves for a second–organizationally, Chrysler launched a new division, Imperial, spun off for its technically formidable ultra-luxury player. 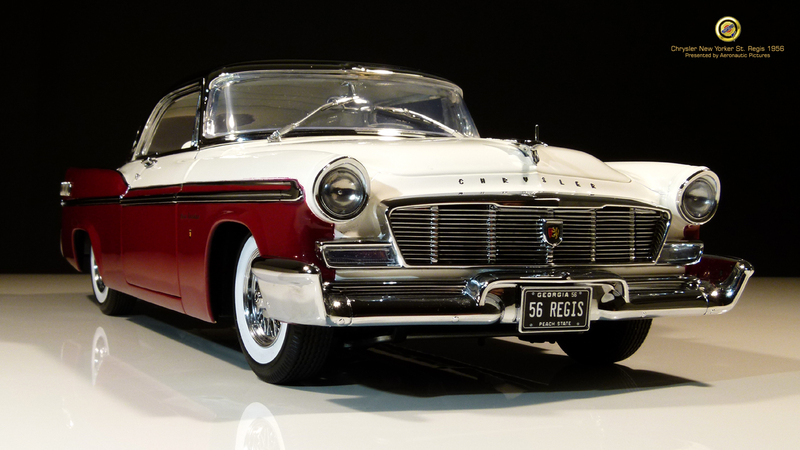 It was still made by Chrysler, the corporation, but it was no longer a Chrysler model; Imperial became its own brand. 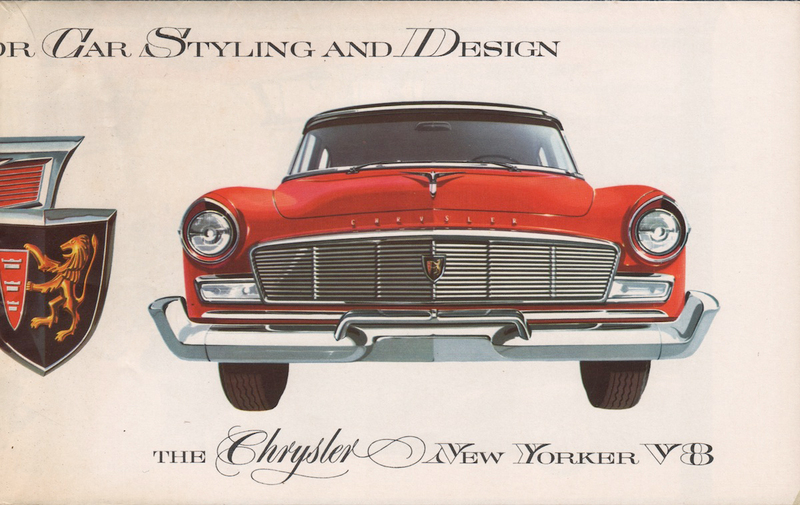 In response, the Chrysler brand expanded in all directions: the 300 model introduced an unexpected new sporting dimension to the marque, and the New Yorker was promoted to the top of the ladder. 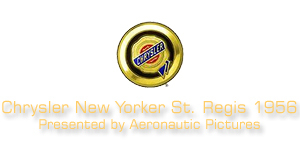 Thus, there was now a hole at the top of Chrysler Division’s lineup where the Imperial used to live, and plugged straight into that gap was the New Yorker St. Regis. 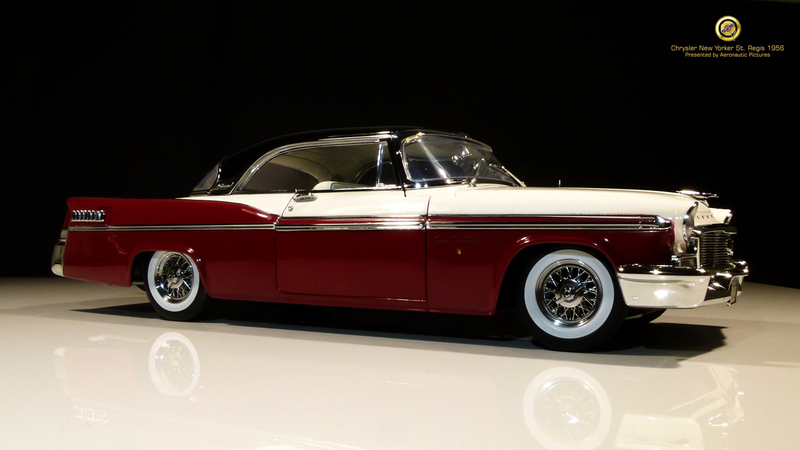 Available only as a two-door hardtop, the St. Regis was basically just a trim option. 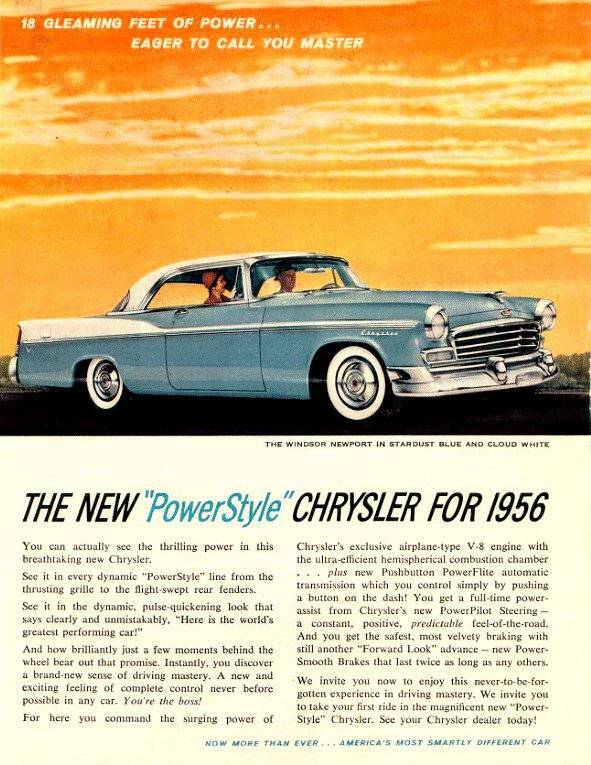 It received the same Fire Power Hemi V-8s as the other New Yorkers did. 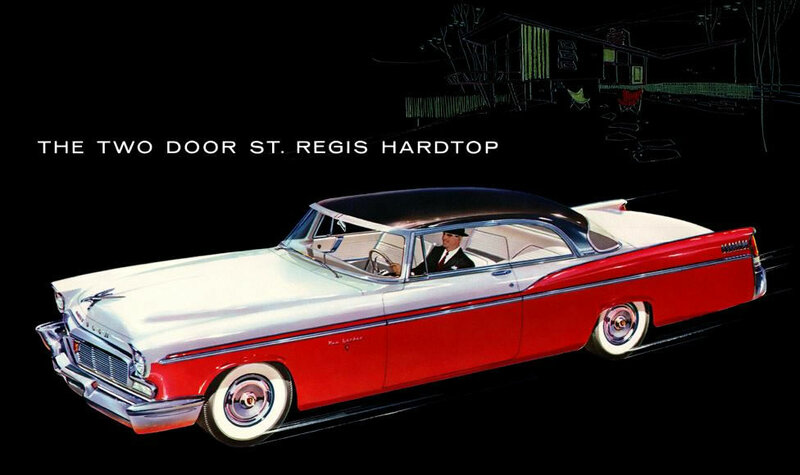 While contrasting-color roofs were common in 1955, the St. Regis used the Windsor’s simple chrome side spear and brought the roof color down onto the hood, the tops of the fenders and the tops of the doors. 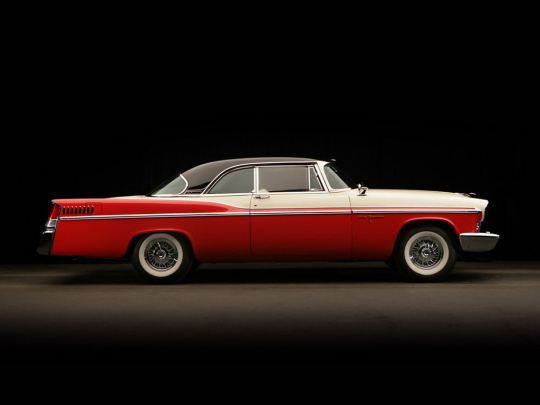 For 1956, with two-tone paint more widely available in the Chrysler line, the St. Regis was given something no other Chrysler had: a three-tone exterior. 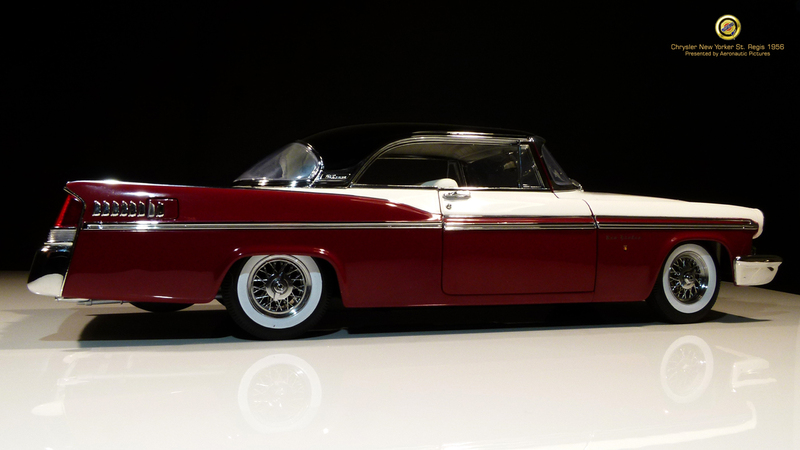 That’s right, the roof could be painted a contrasting color to the rest of the body, whose sides and top surfaces already contrasted, as seen here with this Raven Black, Regimental Red and Cloud White example. 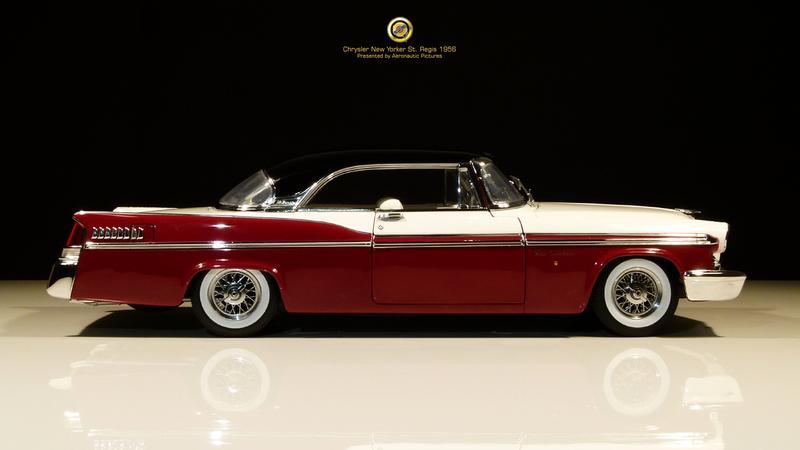 Other St. Regis exclusives included a color-keyed two-tone steering wheel, upgraded interior fabrics like the gray cloth seen on our feature car, and full carpeting. 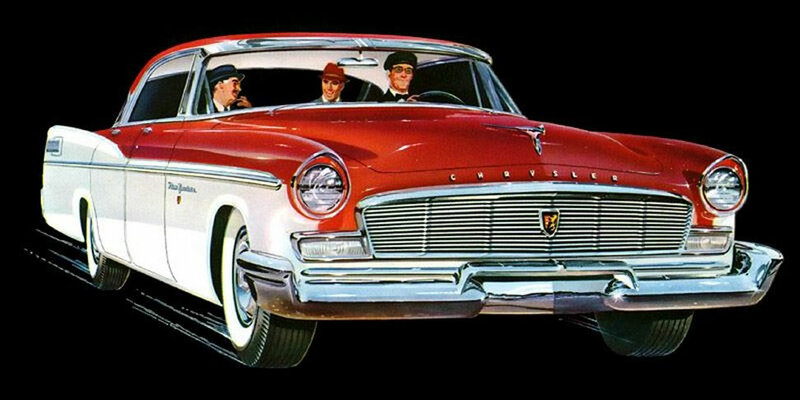 Anyone hoping for a junior Imperial was missing the point. 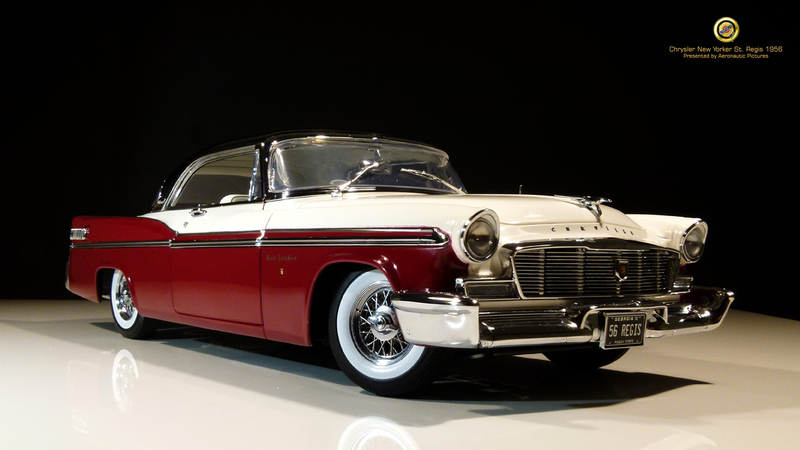 If the St. Regis doesn’t seem to stand out massively from other New Yorkers, consider that it only cost $44 more than a similarly equipped Newport. 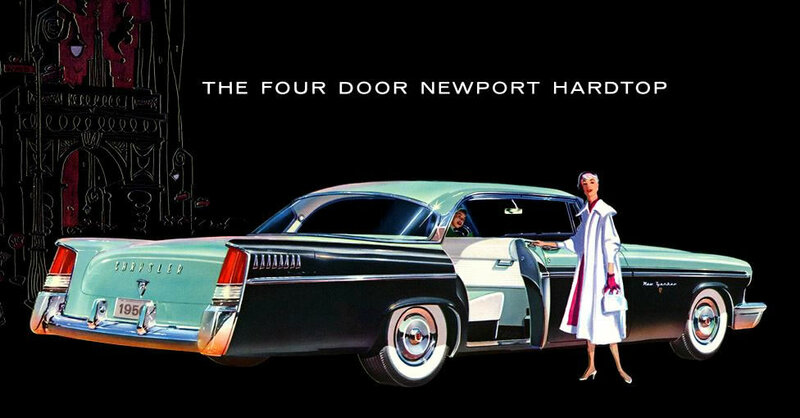 The extra couple of dollars a month to move from Newport to St. Regis worked out to just over one percent of the base price of either automobile. 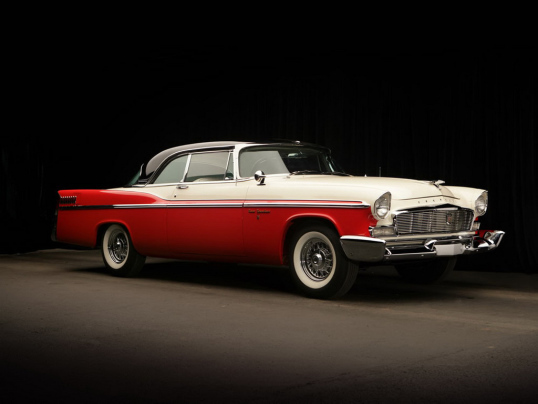 Perhaps as a result of this high-style-for-chump-change maneuver, Chrysler buyers drove home 6,686 St. Regis's for 1956, compared to just 4,115 of the marginally more plebian Newport two-door hardtops. 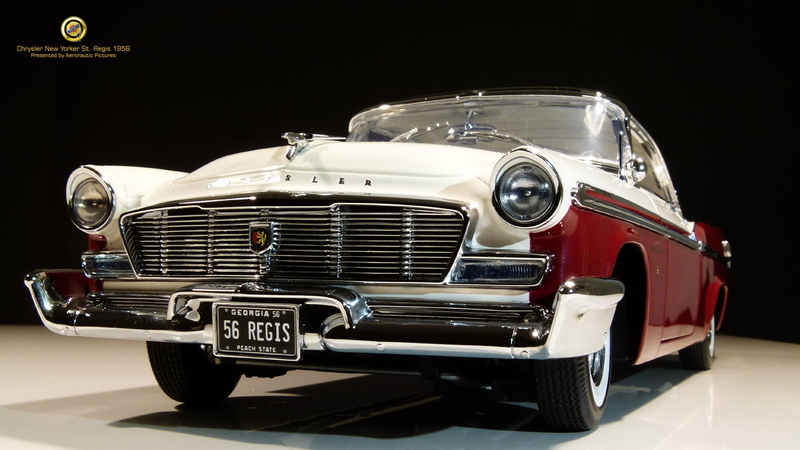 The St. Regis may have been a paint-and-trim option, but it was window dressing on what had become a very nice car indeed. 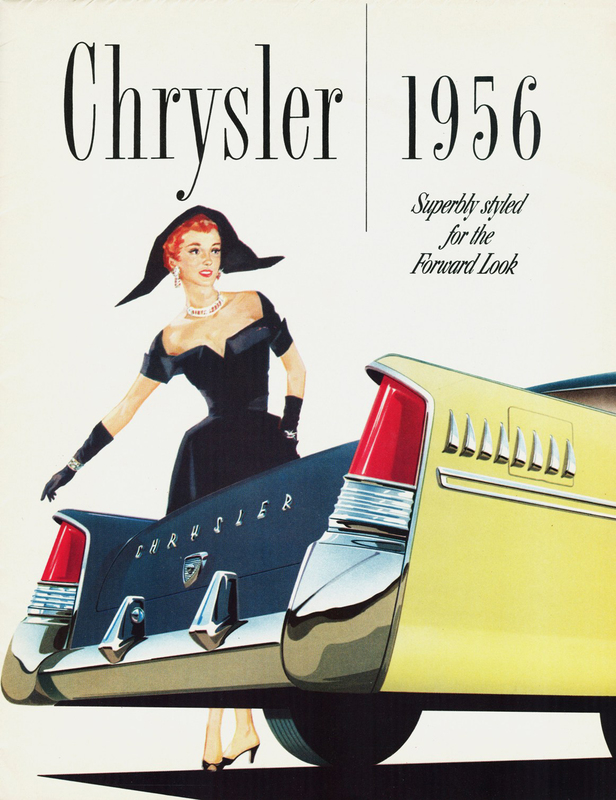 The only two-door Chrysler left was a hardtop–the Club coupe had gone away for the all-new 1955 models–and so it was automatically desirable. 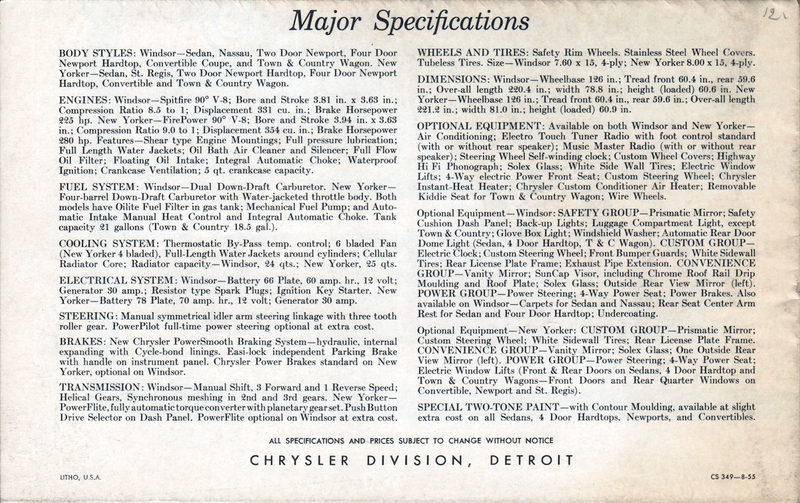 Chryslers had long had the technical innovations to win over engineers and other mechanically minded car buyers–the Hemi engine family was proof enough of their innovative thinking–but style and quality issues were often in question. 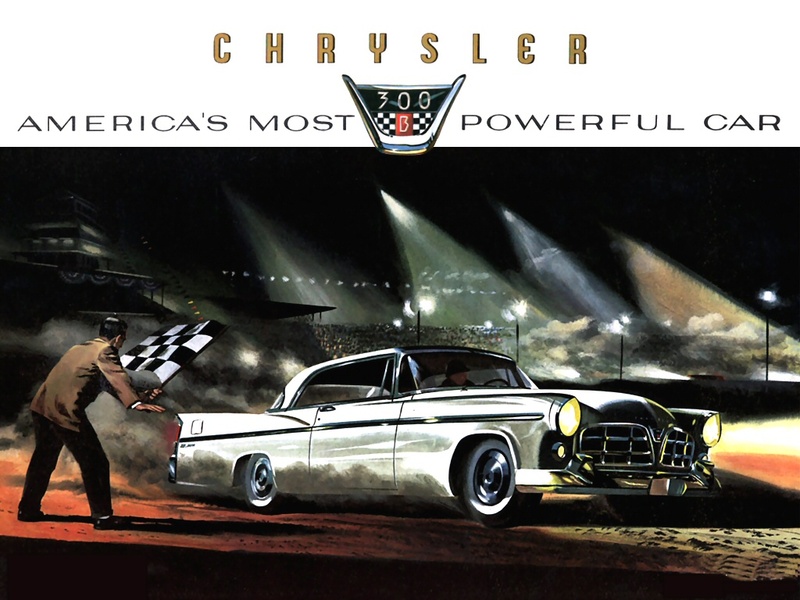 For 1955, all that changed: Virgil Exner was redirected, going from designing all of those wild show cars to penning the bulk of the styling of the new-for-1955 Chrysler line, which was later dubbed “The Hundred Million Dollar Look.” It was well received, and helped launch Chrysler Corporation into second place in the high-priced field, and ninth place overall in the market. 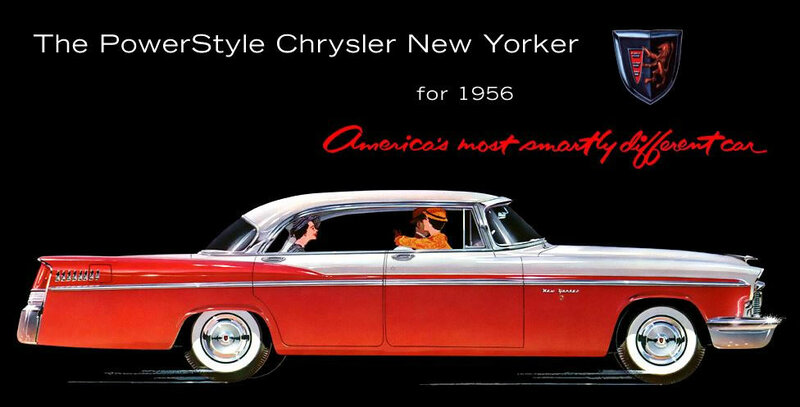 Quality and style were at last merged with Chrysler’s long-standing engineering prowess, and the buying public took notice. 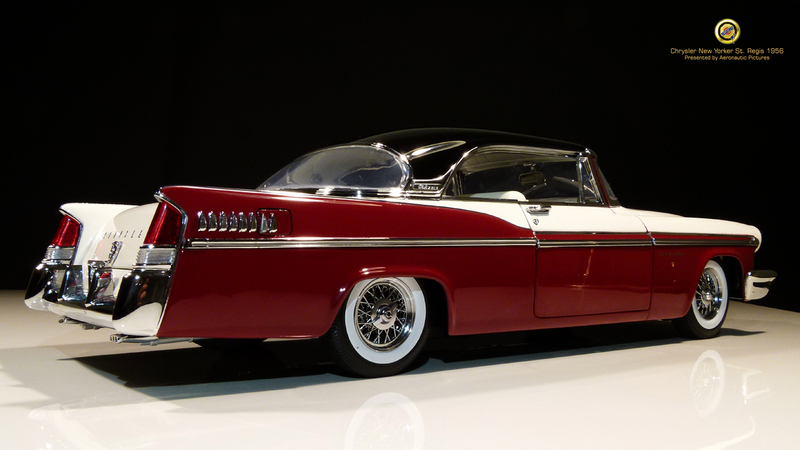 A year later came the customary facelift; rather than tacking additional gingerbread onto a year-old design, the front and rear ends of the car were conspicuously cleaned up. 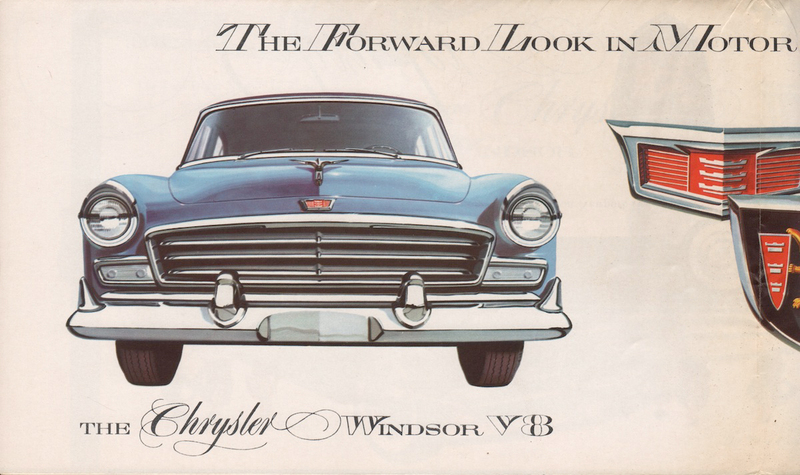 The fussy 1955 grille made way for an upside-down trapezoidal mouth, and clean new “Twin-Tower” tail lamps assemblies were fitted to reshaped rear quarter panels; this was the year of the “Power Style Design.” - Even minor details like the door handles, which were difficult to operate without breaking a nail, were redesigned. 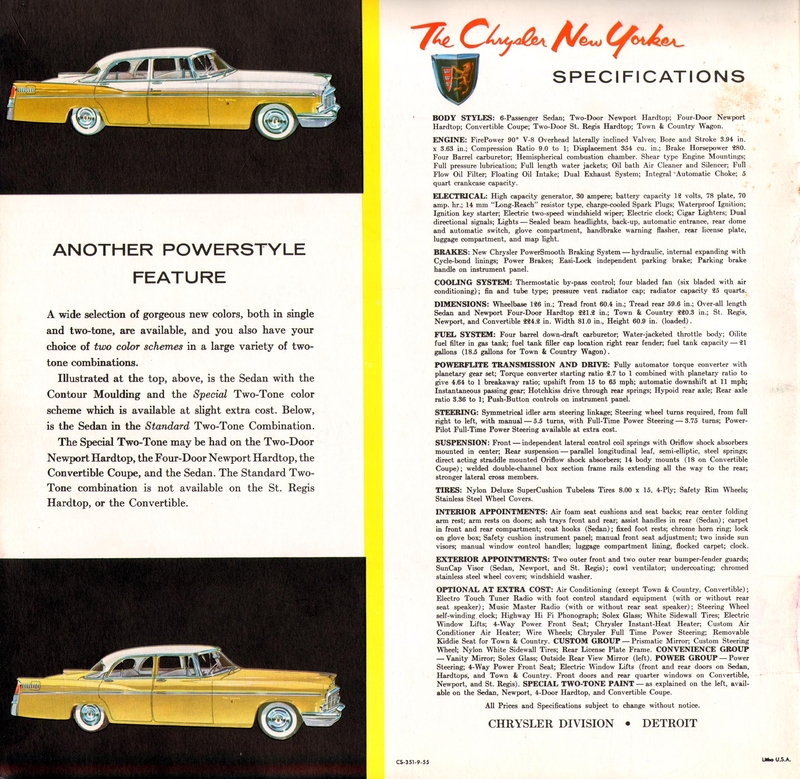 Mechanically, the St. Regis had been revised as well: the 331-cu.in. 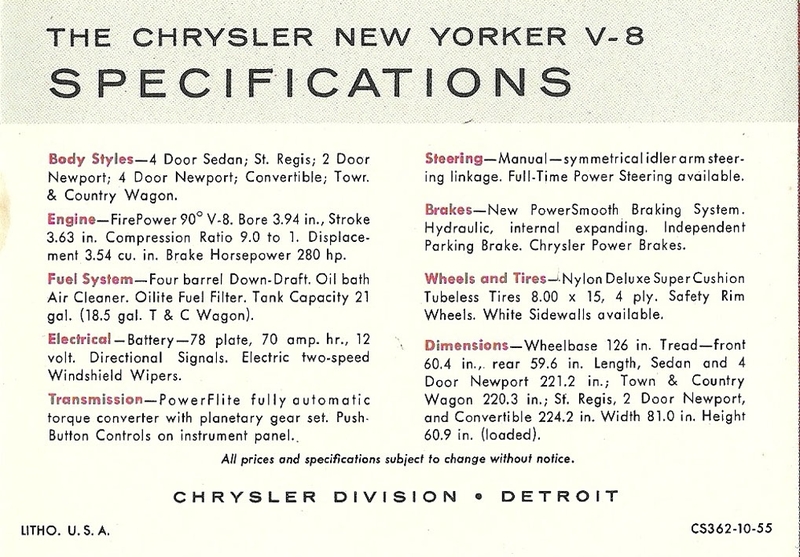 Hemi V-8 now displaced 354 cubic inches and gained half a point of compression, up to 9.0:1, for 260hp. 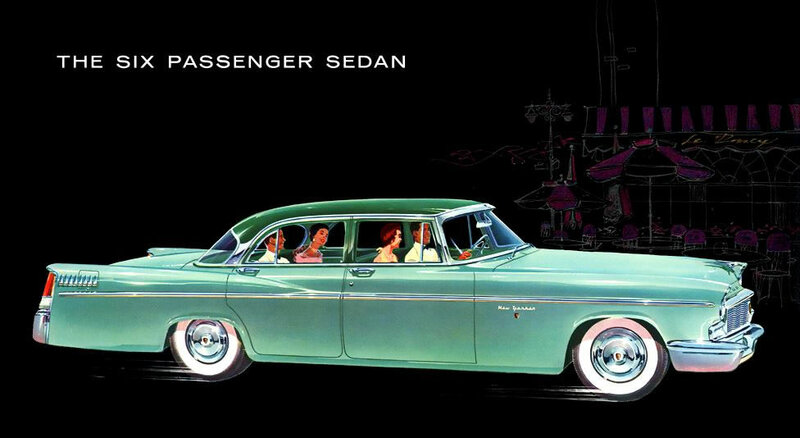 The old six-volt electrical system was replaced by a more modern 12-volt system. 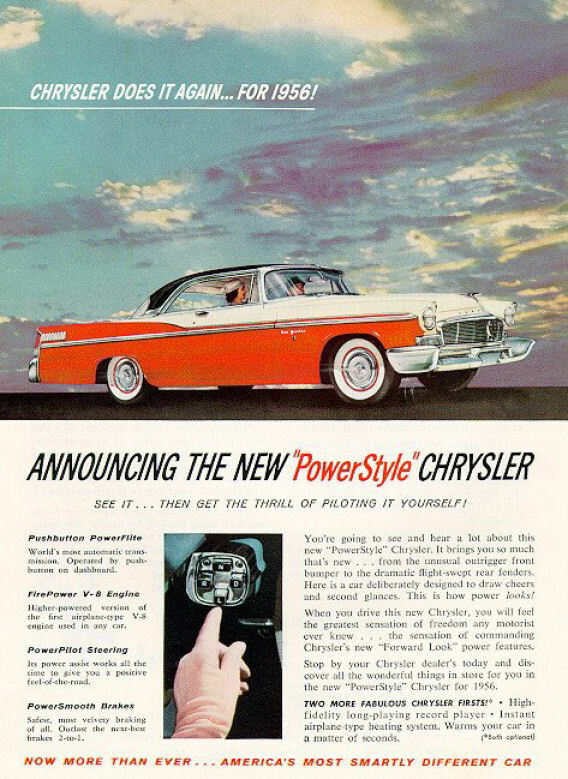 And the automatic transmission did away with a shift lever altogether and moved to a seemingly space-age pushbutton system. 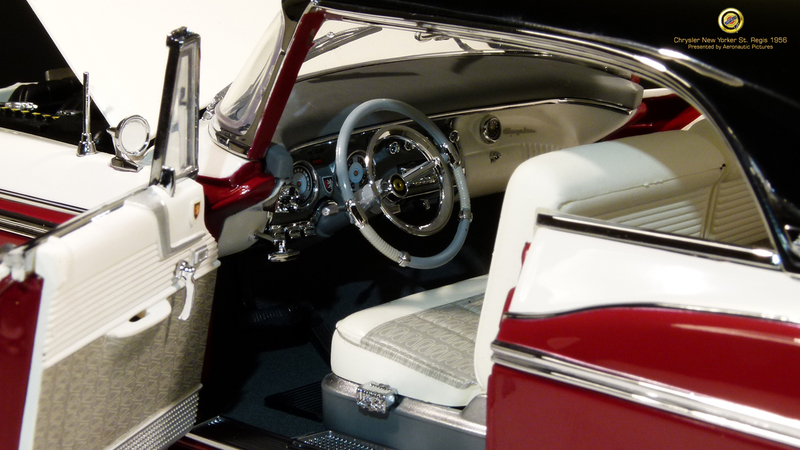 A quadrant of buttons, marked N (neutral), D (drive), L (low) and R (reverse), were located on the instrument panel, to the left of the steering column; there was no Park, so at rest, the car stayed in Neutral with the parking brake on. 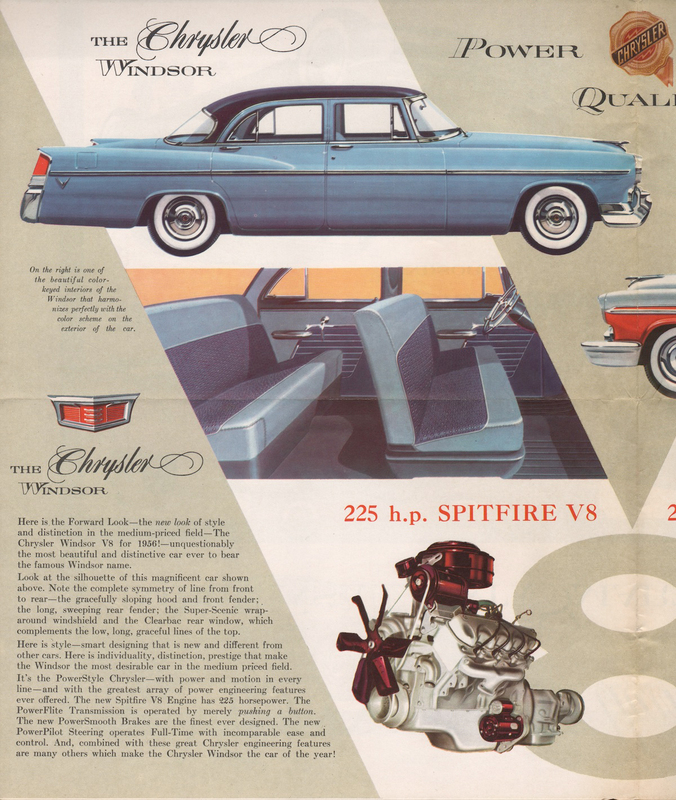 Early 1956 models used the two-speed PowerFlite transmission, while the three-speed TorqueFlite came into use halfway through the year. 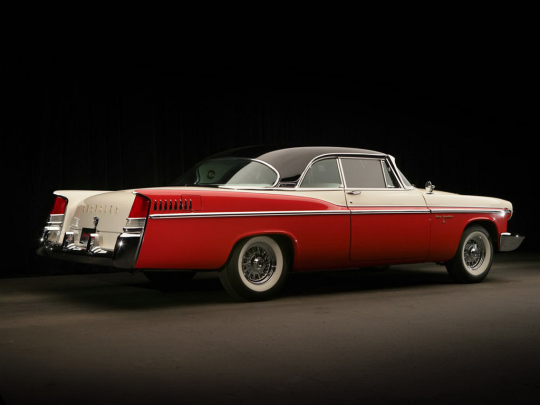 Pushbutton shifting lasted through 1964 in the Mopar world; the TorqueFlite transmission lasted considerably longer. 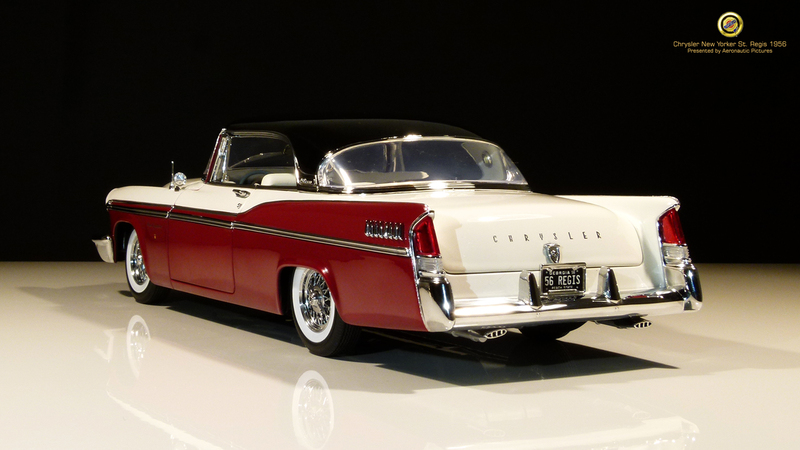 1956 Chrysler New Yorker "St. Regis"